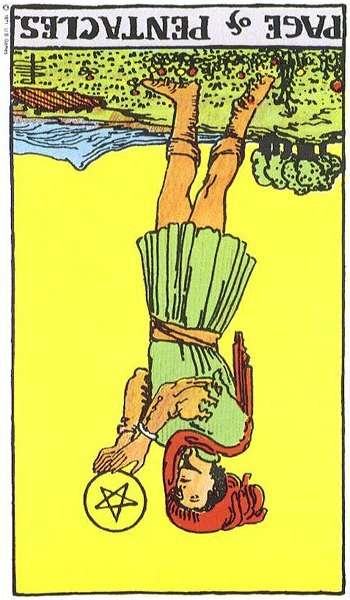 Cards for the Day: R’d Page of Pentacles/The Devil: Let Nature Turn Us Upside-Down. Inversnaid. I always get nervous when The Devil shows up in a tarot reading, and I usually start thinking in terms of addictions and bad habits. 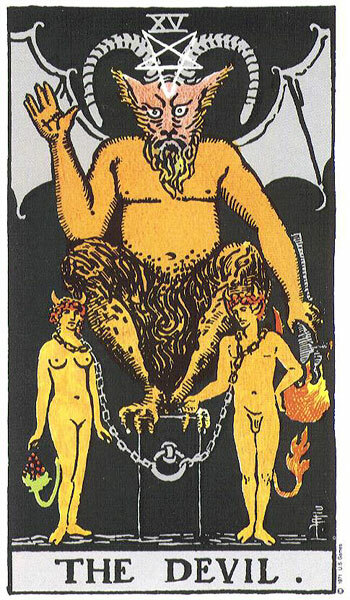 But I was rereading Aeclectic Tarot‘s description of The Devil card today, and she reminded me that this card isn’t all bad. In fact, nothing bad is happening on this card. Two people are standing, naked (doesn’t this card remind you of The Lovers? ), albeit in chains, and they appear to be watched over by the god Pan. (Read more about Pan here.) Is that so terrible? Well, it depends, doesn’t it? Pan is all about the loss of control, “reveling in extremity,” as Aeclectic says. Here Pan is not threatening us — he’s just waving hello. Hi, Pan! Are there times when loss of control is a good thing? Pan is also a god of nature and the wilderness, and in the reversed Page of Pentacles, what is at the top of the card? The earth. Trees. Mountains. Flowers. Growing crops. Nature. So how about a challenge? Let’s let nature turn us upside down a little today, and see what happens. Previous The Spiritual Path: Why Tarot and Not Ministry?